Shoulder & Collarbone - Toms River, NJ: The Center for Orthopedics and Sports Medicine, P.A. The shoulder lets you throw a ball, scratch your back, or reach down to pick up a child. It is the most flexible part of the body, built on a foundation of bones. The bones are connected by ligaments, muscles, and other strong tissues. A healthy shoulder lets you move your arm in almost any direction (a full range of motion). 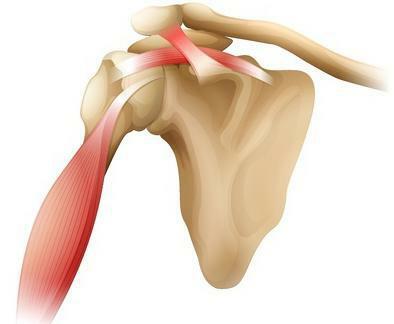 If any of the parts are damaged, shoulder movement can become painful or difficult. Most shoulder problems are caused by wear and tear. An injury or overuse can inflame one or more tendons in the rotator cuff. This causes soreness or weak areas that may tear. If a tear occurs, you may notice a clicking or grating sound. You may also have problems lifting your arm. Repeated stress on the shoulder can inflame joint tissues. Inflammation may affect the bursa (bursitis) or a tendon (tendonitis). Swollen tissues have less space to move beneath the acromion, which can lead to impingement (painful shoulder movement) during overhead activities, such as reaching a high shelf. Over time, smooth cartilage that cushions bones in the shoulder joints can wear out (arthritis). A cartilage wears away, bones in the joint begin rubbing together. This leads to pain and inflammation. It can also cause bone spurs to form. A collarbone, or clavicle, fracture is often caused by a fall onto an outstretched upper extremity, a fall onto a shoulder, or a direct blow to the clavicle. Shoulder arthroscopy is a type of surgery to examine or repair the tissues inside or around your shoulder joint. The procedure uses a small camera, called an arthroscope, which is inserted through a small incision. If the surgeon is going to repair the joint, small surgical instruments are also used, such as a shaver to remove unwanted tissue. Treatment of labral tears is dependent on the severity of the symptoms and the specific characteristics of the tear. Labral tears may be addressed with either refixation (repair of the labral tissue using suture) or debridement (removal of a small portion of the labrum), depending on the type of tear and the patient's age. When the shoulder becomes unstable, the surgeon will reattach the torn tissues. A loose capsule can be tightened, and a torn labrum can be reattached to the glenoid. The Center for Orthopedics and Sports Medicine, P.A.